Back in the summer of 1993, Lord March owner and caretaker of the Goodwood Estates, decided it would be a jolly good wheeze to put on a Hill Climb on the roads outside his house with some of his motorsport chums. 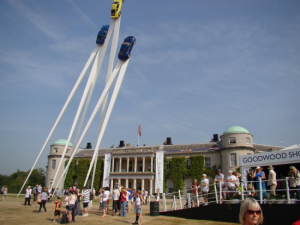 It would be along the lines of a day out in the country with car action added, and so the first Goodwood Festival of Speed (GFOS) was established. Now the good Lord was well connected running the Goodwood circuit close by. By inviting the great and good guaranteed that there would be something for the public interest and that meant revenue stream. By adding an auction on the first (Trade) day and getting one of the finest auction houses in the country to run it, soon all the moneyed celebs were going to appear. They even invited a few hot air balloon teams to attend for a finale flyout but by chance the only team who actually flew were Pat and tony Bubb in G-BUTJ their Viva 77( a never to be repeated feat ). Within a few years this event became a must on the social calendar and by inviting the great and good from around the world to attend and with fantastic sponsorship by logistical experts amongst others, exotic vehicles from around the world that had rarely been seen outside of their own countries started attending in a theme of always trying to usurp the previous year’s wow factor. The major players in the motor industry saw this as a captive audience for showcasing their latest wares and so now it’s not uncommon to see the public launch of new models at GFOS. Inviting the military to show off their wares and add some form of airshow and you have the ingredients of a major event. Over the years there have been many spirited displays of aircraft ranging from South African Airways 747-400, to an Emirates A380, by way of the Red Arrows and the most spirited display of a Vulcan bomber you are ever likely to see. Rally teams wanted a piece of the action and so a dedicated stage was added and heavily modified. With accessibility to all the drivers for photographs and signatures, the public loved it. Over the years the house has become a focal point for superb displays with an annual theme taking precedence. Add old masters from way back in the form of Moss, Stewart, Aggostini and the like and you know why this thing that started so slowly just grows and grows. For your scribe, there is a conundrum as I have a love hate relationship with the place. On the one hand I like a few of the elements that make up the show, and the roads to Goodwood out of Guildford represent cracking roads to ride a motorbike through Milford and Petworth on either the A283 or A 286, but the swathe of people cramming to watch the vehicles up the hill and the general crowd sizes leave me cold, so I have to hatch a plan of action in order to survive the onslaught. The idea is to go early as possible and get away before lunchtime sampling as much as I can hack before the crowd engulfs me. I even usually have a sub plot of finding a supercar along the way and sitting behind it listening to the overrun of its engine or watching it squat under acceleration. For 2013, one of the core ingredients was a celebration of 50 years of the Porsche911(see accompanying article ), and so I wasn’t surprised at 7am on a sunny morning , one in ten cars was a Porsche product with 911’s breaking out like a rash. However the traffic was moving at a reasonable speed and by maintaining an average of about 70mph I could move up the chain until id finds a clear spot. Another thing to avoid on a motorbike is getting shooed all the way down to the circuit for parking and I was delighted to achieve top car park status up towards the famous race course( both easier to get in and easier (more importantly), for a swift exit. At the bottom end of the estate by the start line, there is usually a theme, one year it was military hardware with an Apache helicopter centre stage, another year it might be top fuel cars. 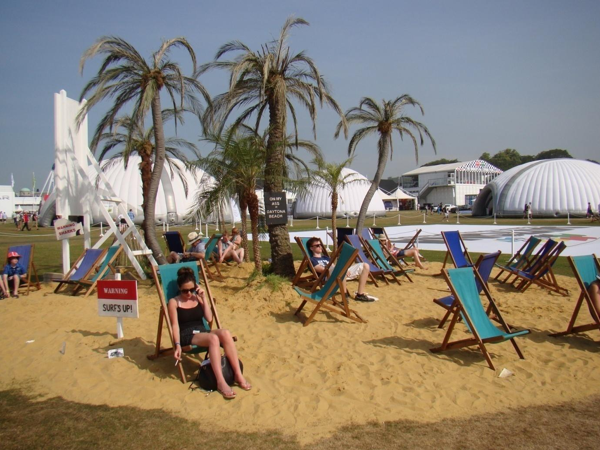 For 2013 the theme seemed to be record breakers but on a sandy beach setting. They even had women in bikini’s parading around. You never know what is going to be parked up in this area year to year and so it proved again in 2013, next to American trucks was a flyable Curtiss Robin G-BTYY. For me the two elements I love the best are the supercar paddock where all kinds of exotic fauna are displayed to potential buyers, and the Cartier Style de luxe, which to those not in the know is an exhibition of really rare and exotic cars worth their weight in gold. Now as expected there were a fair splattering of Porsche items, but amongst them some rare gems. For example these two. The one on the left is a 1908 Rolls Royce Silver Dawn and the one on the right I haven’t the foggiest idea what it is! I would say that this year’s artwork outside the house was a touch too far. Three 911’s on a plinth is an admirable theme but for me it was mounted way too high. 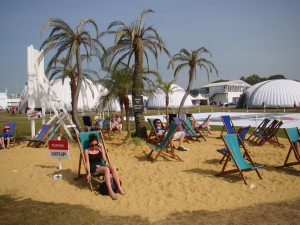 For those whose budget is seemingly limitless, there are plenty of establishments ready to dispose of your finances for salmon and champagne or strawberries and cream or like the majority of us, we sit in the shade with homemade sandwiches and bottled water. So how would I sum up Goodwood 20 years on? I would say that it nestles alongside Wimbledon, Henley, Stella Artois and Ascot races as a see and be seen place for those who love to be loved by the public. Rare gems do appear , such as the Uk’s biggest insurance repair bill (Rowan Atkinson’s McLaren f1 was in the cartier style paddock), and if you are any form of petrol head be it two wheels or four you tend to be shown great skills by the experts who love to show off. Now would I pay to go? Well that’s another story …. For now it’s back to the beach and the cheap seats for me!